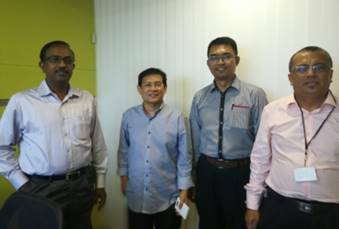 India – On July 24, 2017, Managing Director with General Manager – Business Development, En Razi and International Business & Marketing Manager En Khairulnizam visited a Larsen & Toubro Limited (L & T) office in India. In addition to having discussions with En G Kesavan, Vice President & Head of L & T Business Network Management on existing business in Malaysia, both sides are also looking for business opportunities in the Middle East, Africa and the Indian subcontinent. L & T is a large organization and has over 75,000 worldwide employees with total sales estimated at USD10-15 Billion a year. L & T business preferences are attractive prices, high quality products and long-term relationship for win-win business.